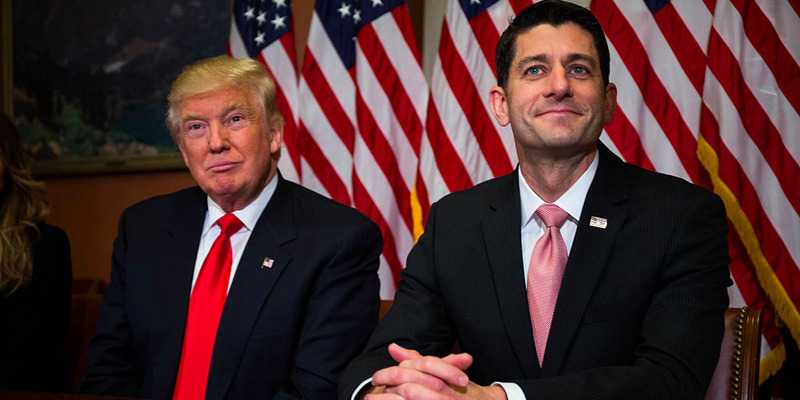 Zach Gibson/Getty ImagesUS President Donald Trump and House Speaker Paul Ryan, the Wisconsin Republican. The House GOP unveiled its massive tax-reform bill on Thursday. Some features proposed: a new top tax rate, new tax brackets, a lower corporate rate, and a compromise on the state and local tax deduction. The bill is the biggest step yet toward the GOP’s promised overhaul of the US tax code. House GOP leaders on Thursday took their biggest step yet in their attempt to overhaul the US tax code by releasing legislation that proposes sweeping changes to the current system. The 429-page “Tax Cuts and Jobs Act” includes a broad set of proposed changes to the corporate and individual tax system, building off a nine-page framework that the White House and congressional Republican leaders dropped in September. 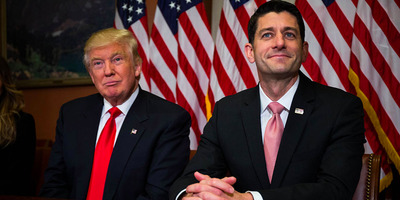 “My administration will work tirelessly to make good on our promise to the working people who built our nation and deliver historic tax cuts and reforms — the rocket fuel our economy needs to soar higher than ever before,” said US President Donald Trump, who has expressed a desire to sign a bill into law by Christmas. House Ways and Means Committee Chair Kevin Brady, the author of the tax bill, said the House should pass the plan by Thanksgiving. Significantly, Brady said the bill would add $US1.51 trillion to the federal deficit over the next 10 years. The Senate is set to use the process known as budget reconciliation to move the bill and avoid a Democratic filibuster. Among other rules, the reconciliation framework in the recently passed budget resolution allows for the bill to add $US1.5 trillion to the deficit over 10 years. Brady, House Speaker Paul Ryan, and other House GOP leaders touted the bill in a press conference on Thursday and argued it would save the average family of four $US1,182 a year on their taxes. But different groups would benefit in different ways from the plan. How the gains would be distributed among different income groups and localities was not yet clear. The highest tax bracket would remain at 39.6%: According to reports, the plan would propose a fourth marginal tax bracket on high-income earners. It will reportedly apply to married couples making more than $US1 million a year. 12%: Applies to incomes up to $US45,000 for an individual and $US90,000 for a married couple. 25%: Applies to incomes up to $US200,000 for and individual and $US260,000 for couples. 35%: Applies to incomes up to $US500,000 for an individual and $US1 million for couples. For single parents that are heads of households, the thresholds would be the midpoint between individuals and joint filers, expect for the highest bracket which would still kick in at $US500,000. A change to the state and local tax deduction. One of the biggest hangups for Republicans in states like New York, New Jersey, and California has been the proposed elimination of the state and local tax (SALT) deduction. The benefit allows people to deduct those taxes from their federal bill. Brady said Tuesday the GOP reached a deal that would allow people to deduct state and local property taxes up to $US10,000 but not income or sales taxes. Corporate tax cut will be immediate and permanent. The cut to 20% from the current 35% will is designed to be permanent. Elimination of the estate tax. The threshold for the tax, which applies only to estates with greater than $US5.6 million in assets during 2018, would double to over $US10 million. Then, the plan would phase out the tax after six years. The Senate GOP appears to be mulling preserving at least part of the tax. Repatriation tax rate. The repatriation rate will be a mandatory one time tax on overseas assets for US companies. Illiquid assets would be taxed at a 5% rate, spread out over a longer period than liquid assets like cash which would be taxed at a 12% rate. No repeal of Obamacare’s individual mandate. Despite Trump’s last-minute push to eliminate the penalty for not having insurance, such a provision was not included in the plan. No changes to 401(k) plans. Despite a back-and-forth between House tax writers and the White House that appeared to suggest some change to retirement-savings accounts would be included in the tax bill, there were no changes proposed in the first iteration. Increase in the size of the child tax credit. A pet project of Ivanka Trump, the proposal is to increase the credit to $US1,600 from $US1,000. The bill would also add a credit of $US300 for each non-child dependent or parent for five years, after which that provision would expire. Limiting home-mortgage-interest deduction. On new-home purchases, interest on loans up to $US500,000 would be deductible. The current limit is $US1 million. A larger standard deduction. To avoid raising taxes on those currently in the 10% tax bracket, the standard deduction for all taxes would increase to $US12,000 for individuals (up from $US6,350) and $US24,000 for married couples (up from $US12,700). These are slightly less than the doubled deductions expected — and, as Business Insider’s Josh Barro has written, the idea that this would save people money may be misleading since it eliminates other personal deductions and a secondary standard deduction. A 25% rate for pass-through businesses. Instead of getting taxed at an individual rate for business profits, people who own their own business would pay at the so-called pass-through rate. There will be some guardrails on what kinds of businesses can claim this rate, to avoid individuals abusing the lower tax. Elimination of the student-loan-interest deduction: The amount paid toward student loan interest can currently be deducted. Elimination of the medical-expense deduction: Under current law, individuals who spend over 10% of their income on medical expenses are allowed to deduct part of those costs from their taxes. The proposed new bill would remove that deduction. Elimination of the moving deduction: This allows anyone who moved to a new home in the past year to deduct moving expenses. Repeal of the alternative minimum tax (AMT). The tax, which forces people who qualify because of an outsized number of deductions, would be eliminated under the legislation. Incidentally, Trump’s own tax bill has been shown to be millions of dollars more because of the tax. Create a tax on large private university endowments. Private universities with assets of more than $US100,000 per student will pay a 1.4% excise tax on their net investment income. Repeal the Johnson Amendment. The current rule prevents tax-exempt nonprofits from making explicit election endorsements. Eliminate the ability to deduct interest on bonds for sports stadiums from federal taxes. Currently, local governments issue bonds to pay for the construction of sports facilities, this would prevent people from deducting interest income form those bonds on their federal taxes. As details of the bill began to trickle out, reactions poured in. The changes to the mortgage-interest deduction and other provisions sent stocks of homebuilders sliding. The SPDR S&P Homebuilders ETF was down roughly 2.5% Thursday morning and shares of major builders D.R. Horton, Pulte Group, and Lennar all slipped. On the other side, Business Insider’s Joe Ciolli reported that companies with a higher effective tax rate and those with a lot of money held overseas rallied strongly on the release of the bill in anticipation of possible higher profits. Outside of the markets, politicians and advocacy groups immediately rushed to react to the bill. The National Association of Realtors told Business Insider’s Akin Oyedele that the bill would not benefit homeowners. The National Association of Homebuilders also took a shot at the bill. “The details that are coming out show that the House Republicans are picking large corporations and wealthy Americans over small businesses and middle-class American homeowners,” Jerry Howard, the NAHB’s CEO, said. Republican Sen. Marco Rubio criticised the size of the increase for the child tax credit on Twitter, saying it did not go far enough. “House #TaxReform plan is only starting point. But $US600 #ChildTaxCredit increase doesn’t achieve our & @POTUS goal of helping working families,” Rubio said.